New! 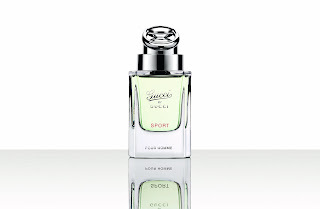 Gucci by Gucci SPORT pour Homme. Gucci goes back to the past in their approach to packaging, and with that, moves the brand forward heaps. The distinctive red and green Gucci stripe is back with a vengeance and not a moment too soon; The stripe of quality, heritage and kudos (as my old 80’s Gucci snaffle loafers will testify). Retro Gucci lettering is immediately identifiable with the 1960s and 1970’s Gucci of yore, synonymous with film star glamour and heritage glitz. Plus ca change, reste la meme chose. The fragrance is divine. The press release tells me it “introduces a more casual sensibility and a broader allure.” Yes, it’s nonchalant and fresh at first as the scent hits you and kicks in, by way of the citrus and aromatic notes but this soon mellows down to a musky sexiness by way of Corsican fig nectar and woody Patchouli, a signature Gucci ingredient. It reeks of smooth 1970’s zingy freshness but transported to 2010 by way of louche models, movie stars and San Tropez. It encapsulates freshly scrubbed, well groomed man with a scented edge. It’s far more Sean Connery in his ‘From Russia with Love’ and ‘Goldfinger’ days at the height of his Scottish suaveness, all swagger and innuendos, in his mid thirties and looking hot than Daniel Craig’s deeply moody, brooding meanness in ‘Casino Royale’. In reality, the fragrance is fronted by James Franco (star of ‘Milk’ and ‘Spider Man’) all rugged good looks and raw acting talent. The brilliance of this striking new scent lies in the appeal to a woman. This is one fragrance I’d happily wear and already have. It’s rather like stealing a shirt from your boyfriend or husband…the scent of him lingers all day. Yes please! The Gucci by Gucci SPORT pour Homme range of products is launched in Selfridges from April 2010 and is available nationwide throughout the UK from May 2010. The Eau de toilette spray starts at £40 for 50ml.